Rhea Black and Kiefer Hahn are co-owners of Momentum Athletic Training in Missoula. Both Rhea and Kiefer are also accomplished trail runners. I won a free month of classes at Momentum and really enjoyed the experience. I found the classes to be full of variety with a focus on exercises to strengthen specific muscles for avid outdoor athletes including trail runners. What inspired you and Kiefer to open Momentum? Kiefer and I opened Momentum almost 12 years ago. 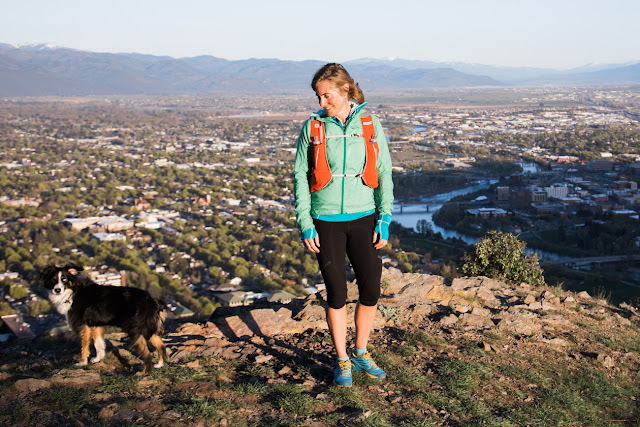 In 2005, there wasn’t a physical location in Missoula where like-minded athletes could train specifically for endurance events with guidance from an expert. Opening Momentum allowed us to offer sport specific classes geared at endurance athletes like runners, cyclists and skiers as well as individualized training plans too. What does a typical class at Momentum look like? Momentum classes last 1 hour and are set up as a circuit of 18 - 1 minute stations that include strength work, CORE, agility training, balance work, plyometric (jump) training and cardio. We can take 18 people in a class. People in the class range from beginner to expert and we accommodate that. The common goal is improved fitness for outdoor pursuits and preventative care so you don’t end up injured. What benefits can trail runners experience after taking classes at Momentum? 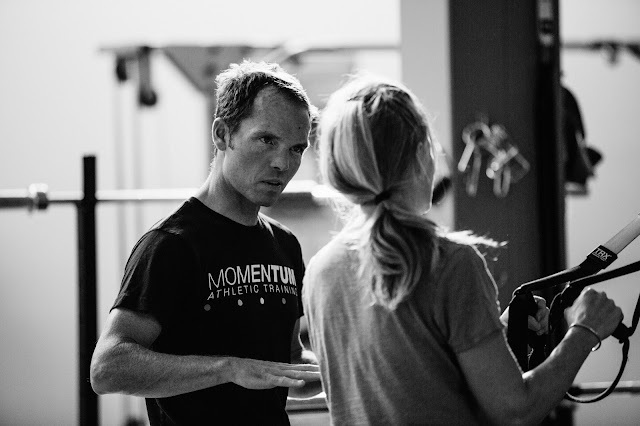 The overwhelming feedback that we get from clients is this: After integrating Momentum classes as part of their specific running, skiing or cycling training - clients feel stronger, have improved endurance and are faster. They experience decreased recovery time after long efforts. Injuries are less common and if they compete, they have better results. What advice can you give someone interested in creating a business that involves what they most enjoy? Getting to do what you enjoy as a job is a gift. I feel extremely lucky to be in this place. Make a plan and before you start, do your research and make sure that it has viability in your community. How did you evolve as a trail runner? I found my way back to trail running by moving away from Missoula in the late 80’s- early 90’s. Living in other places where trail running was not accessible like it is here - made me realize how much I value having trails to run on so close to where I live. I don’t ever take that for granted. I run Missoula trails most days of the week. 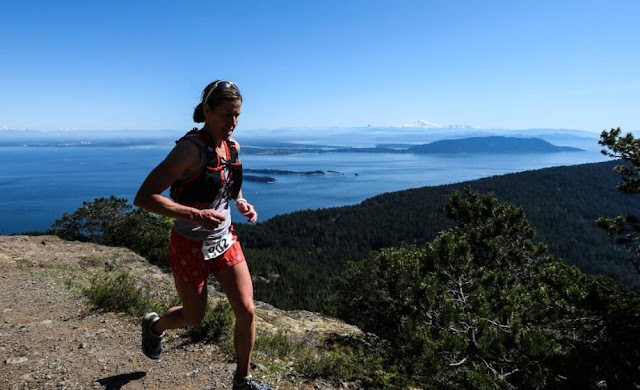 I love to climb mountains and it evolved from exploring local trails, to competing in trail running events locally and around the US. What are a few of your most memorable running accomplishments? Most of my memorable running accomplishments come from bringing friends together to run in Missoula, Glacier or down in the Bozeman area. It’s more fulfilling for me than racing. Showing a client a new trail or just hiking up the Pengally Ridge with a person who has never experienced or seen Missoula from that perspective is rewarding and makes me very happy. There are soooo many. But in the running world - I would say the best advice I have received and now know is that recovery/rest is as important as the training itself. You have to give back to your body if you want it to work well and feel good over the long haul. This was something I read over and over but never took to heart until I had to and now I feel better than I ever have. So - eat well, rest, get massage and/or stretch in addition to all of those miles you are logging! What is your specialty at Momentum? I love working with women - who have had children and are busy. I help create schedules that are realistic, effective and fun. I like to help with the nutrition side of things too. As we age, nutrition becomes a very important component to feeling your best! As a busy mom myself, I have had experience and success with this. So, I can relate. Thank you Rhea and Kiefer for supporting Montana Trail Crew's Mountain Running Film Festival and Run Wild events!